many students focus on learning the EXACT steps by memorizing the SPECIFIC molecules presented in their books and lecture slides. Then, when something looks even slightly different on the exam, they panic! One such scenario: replacing water with alcohol in a reaction sequence – either as the attacking molecule or as the solvent. Acid catalyzed hydration using an alcohol solvent instead of water. Or Oxymercuration using alcohol instead of water for the Alkoxymercuration reaction. How do you quickly mentally swap the water reaction into an alcohol? How do you easily complete the new reaction? Forget organic chemistry and bear with me for a moment. No matter what you do, You are You. But You are STILL You. And your friend recognizes you. They recognize you because you are you. Now imagine that you’re walking down the street wearing a heavy backpack. Thanks to a big exam tomorrow you have about 20 pounds of textbook, notes, and more weighing you down. Perhaps you’re walking differently to compensate for the weight. Perhaps you have trouble getting onto the crowded morning train due to the bulk of your backpack. Perhaps the other commuters can’t crowd you as tightly due to the bulk of your backpack. (I used to purposely wear my backpack in the front on a crowded bus/train preventing people from crowding my breathing space). You just happen to be carrying a whole lot more than you normally do. Hang on to that thought for a minute. What makes water such an ideal solvent for reactions? The water molecule H2O features two hydrogen atoms covalently bound to oxygen. But this is not a ‘balanced’ covalent bond. Oxygen is highly electronegative and pulls on the electrons between itself and hydrogen. This concentrates negativity around the oxygen atom, leaving both hydrogen atoms partially exposed with a partial positive charge. To really understand this we need just ONE oxygen and ONE hydrogen. In most reactions, the oxygen is ultimately de-protonated so that just one hydrogen is removed. If we call that extra hydrogen a backpack and turn it into a circle, does the reaction still proceed as expected? Yup, nothing changed. It’s just the OH reacting with a backpack. For example an ANY alkyl group represented by the letter R.
Same mechanism, but since the product has an OR instead of an OH the product is an ether instead of an alcohol. Do you see how oxygen still reacts the same way? Oxygen’s electrons still attack the carbocation, and the one hydrogen is still removed in the final deprotonation step. This happens regardless of the other group or backpack attached to the carbon atom. 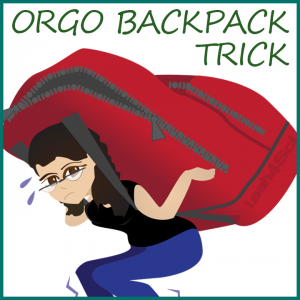 how can you apply the backpack trick when working quickly through reactions? FIRST learn and understand the logic BEHIND the trick or shortcut. Then study the fast and simple method to save you time. That’s it, that’s your final product. And now let’s try alkoxymercuration which is the same reaction as above but with alcohol, ie: oxygen carrying a carbon chain backpack. This tutorial is just the first step to learning and understand organic chemistry concepts and reactions. Don’t let the semester take you by surprise forcing you to play catch-up. Click below to download EVERY Leah4sci Orgo Cheat Sheet in a single full color PDF download. You’ll also get access to tutorials, study tips and tricks, and Upcoming LIVE Workshop announcements! Now that was VERY HELPFUL! Thank you Leah! I’m restarting my MCAT study plan tomorrow with plans to take the MCAT end of January. I consider myself a weak student in the sciences because I’ve been out of school for a long time. Thanks for this tutorial! You’re very welcome Maria. Everyone is ‘weak’ when they start out, but that’s what studying is all about. Create a proper plan and give yourself the time to learn and practice. Thank you….you make the concept soo easier..